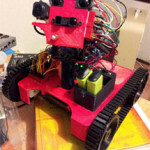 Rosco had a great time at the OC mini Maker Faire last weekend and is eager to go to more! If you are organizing a Faire or just want us to come out demo our bot or speak to your club or class please contact us! Rosco in the OC Register! The OC register had a journalist on the scene of the OC mini maker Faire and Rosco made it into the video (59 second mark). No mention but definitely could of won “Best in Show”! https://www.arxterra.com/wp-content/uploads/2018/03/rosco2013.jpg 433 638 Sean Copp /wp-content/uploads/2013/04/Arxterra-Logo-340x156.png Sean Copp2013-08-19 18:59:212018-03-29 06:56:53Rosco in the OC Register! Our project, RoSco, has been a struggle throughout the semester. This document is a testament to our willpower and determination. By Gary Fong (Project Manager/Manufacturing) For our prototype, we put together some parts to simulate the lifting function because we did not have our 3D printed treads and wheels. Using moldable plastic, duct tape, tinker toys, and hard styrofoam, we put together a prototype. Here is a video of our rover prototype and here. By Youssef Al-Shanti (Mission, Systems, and Tests) Software Design: The picture above is the block diagram for our software. you can see from the block diagram the big picture of how our software works. the blocks in red are the functions responsible for sending and receiving data to and from the Rosco.